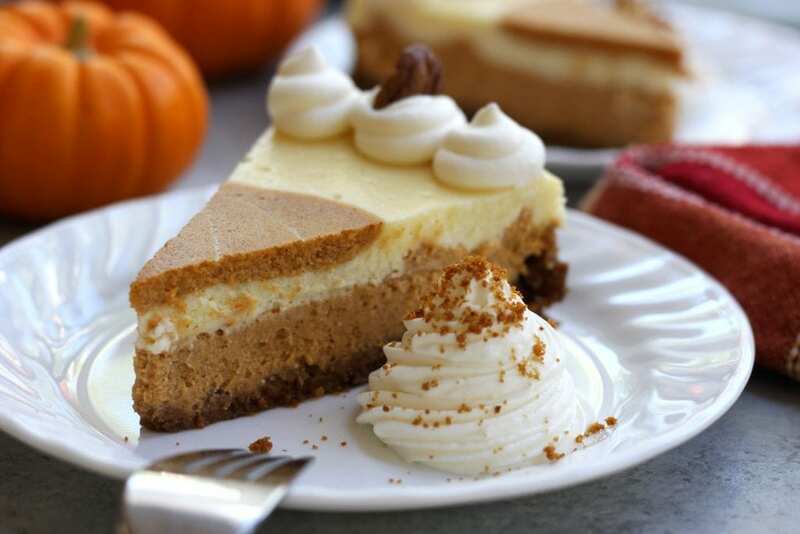 Creamy and decadent, this Layered Pumpkin Cheesecake stands above the rest with a gingersnap, graham and pecan crust. Layers of pumpkin and vanilla cheesecake make this a beautiful and delicious dessert for your Holidays. 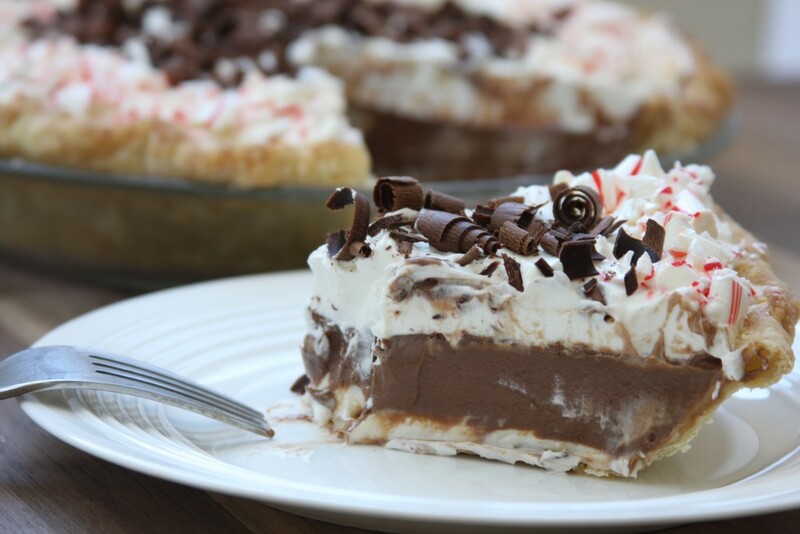 Growing up we used to make Philadelphia Cream Cheese Pie for our Holiday celebrations and to this day I still adore that pie. 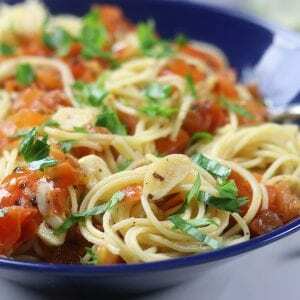 I always loved how the recipe created a wonderful creamy and silky texture. Because of that pie I was never a huge fan of cheesecake. In comparison, cheesecake seemed so dense and dry to me. That is until I had my cousin’s Niki’s cheesecake. 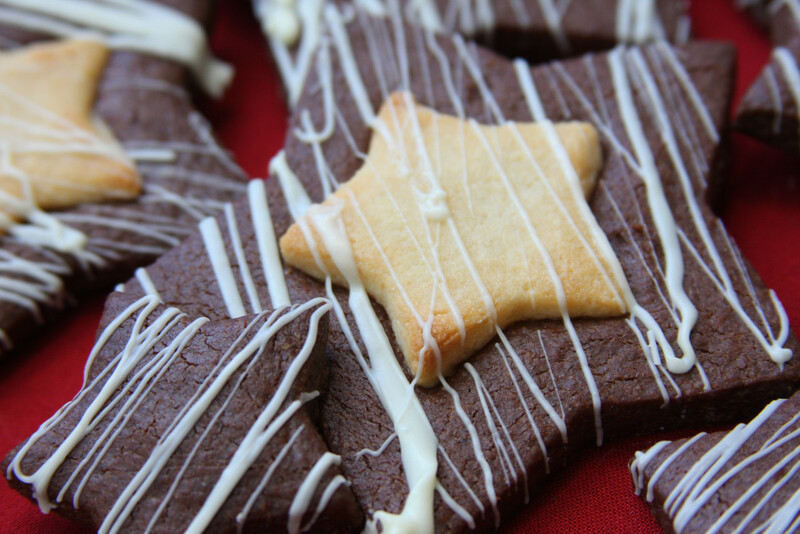 To catch you up to speed, Niki was a chef in the Coast Guard and prior to that has always adored baking. 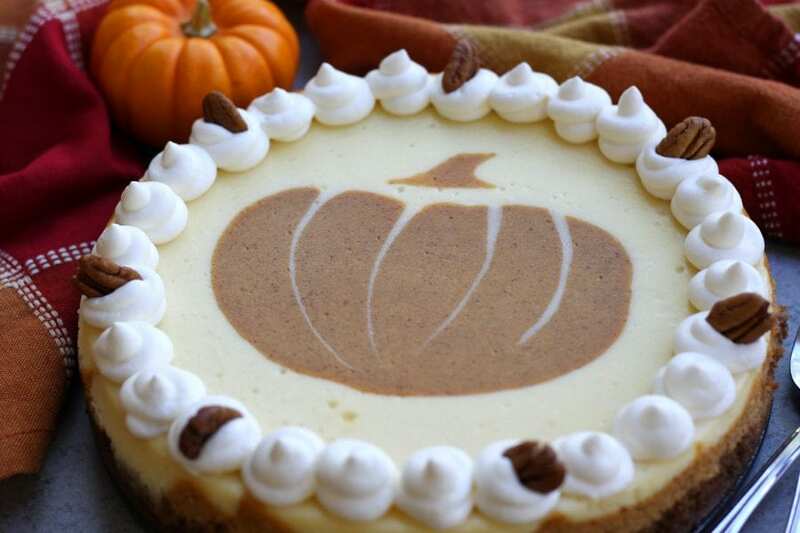 She is an absolute phenomenal baker and amazes me with her creations as you can see from this gorgeous Pumpkin Cheesecake. This is her original idea and I feel so honored that she has shared this with me to share with you. I am absolutely positive this will steal the show at your Holiday get together. Not only is this Layered Pumpkin Cheesecake gorgeous but it unbelievably delicious. By far the best Pumpkin Cheesecake I have ever had! 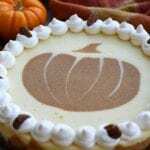 Commonly Asked Questions On How To Make Pumpkin Cheesecake. Why should the eggs and cream cheese be room temperature? This really is one of the more important steps to creating a smooth, luxurious cheesecake. If these two items are not room temperature then they will not blend together well and you will end up with a chunkier mixture. Usually placing the eggs and packages of cream cheese out on the counter about 4 hours before baking does the trick. Pro tip: If you are in a hurry carefully submerge eggs into lukewarm water, changing the water a few times and cut the cream cheese into smaller chunks letting it rest on the counter in a slightly warmer location. 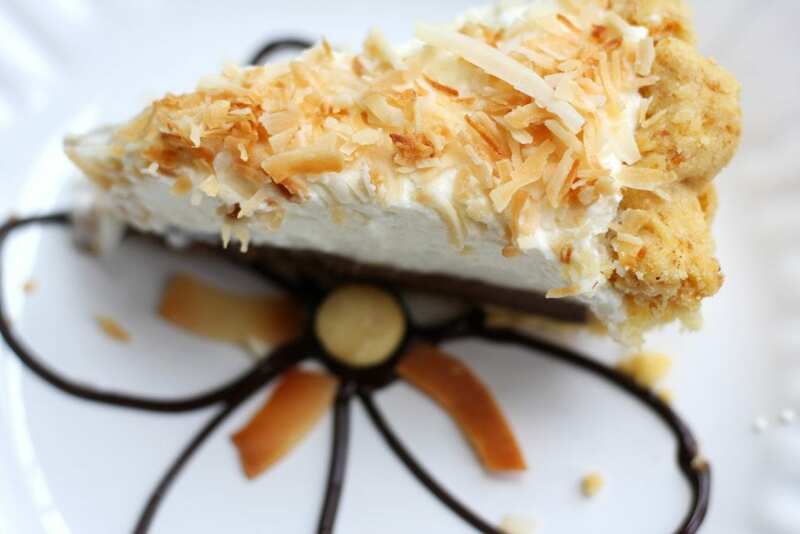 How do I make the cheesecake crust? Can I just gingersnaps for the crust? Yes, absolultey! Just know though that the combination of ginger snaps, graham crackers and pecan makes for an incredibly delicious crust. To grind the cookies place the in a large ziplock bag and beat with a rolling pin. For even easier grinding of the cookies and nuts just use this. What steps should I take to make an extra creamy cheesecake? An extremely important step is to cream the cream cheese and sugar together until completely smooth before adding eggs. Also, add 1 egg at a time and beat well before adding another egg. I honestly don’t know what I would do without my KitchenAid mixer for doing this. It does such a phenomenal job of making perfectly smooth cheesecake filling. Click on photo to make this mixer your own. 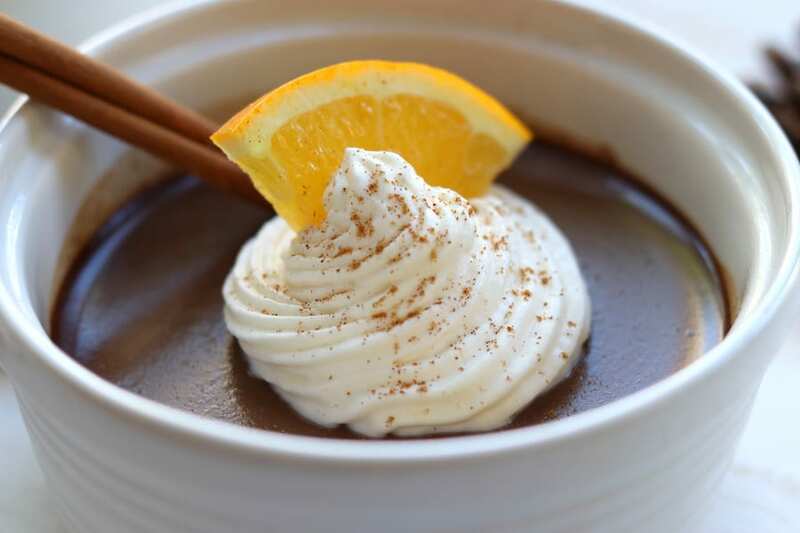 Another secret to creating silky smooth cheesecake is to scrape down the sides of the bowl often, before and with each and every time another ingredient is added. 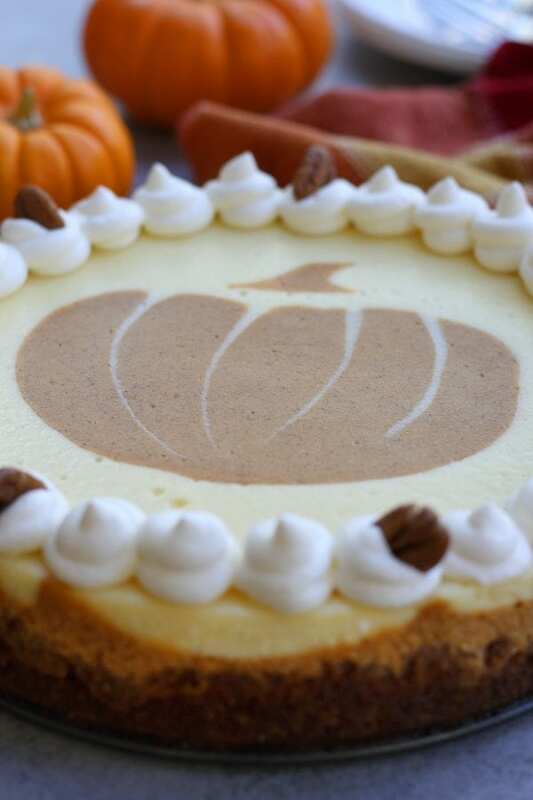 How did you make the pumpkin on top of the cheesecake? See video for visual instructions on how to create layers and pumpkin shape. How can I prevent cracking on the top of the cheesecake? I want a perfect cheesecake! Click on photos for these helpful cheesecake tools. Please help with how to tell if cheesecake is done? The baking process will take about 1 full hour. To tell when it is done the top of the cheesecake should no longer be shiny and the center will be only slightly jiggly when nudged. 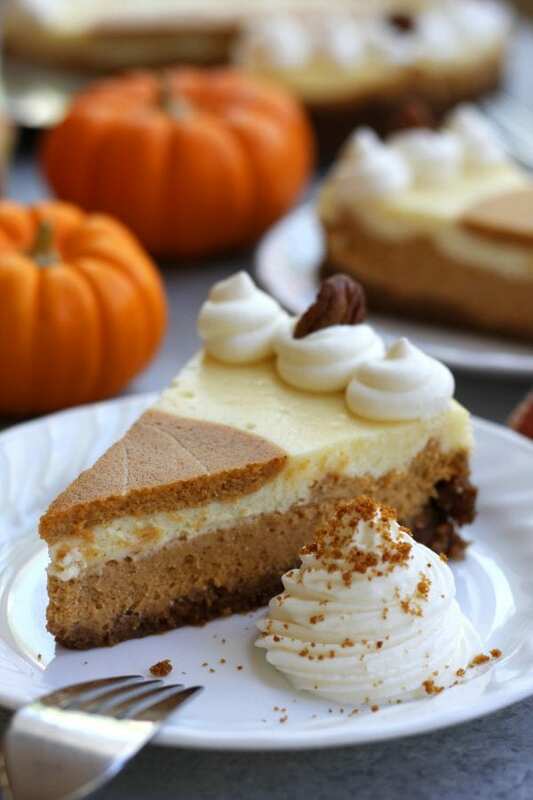 Layers of vanilla and pumpkin cheesecake with a gingersnap, graham and pecan crust. 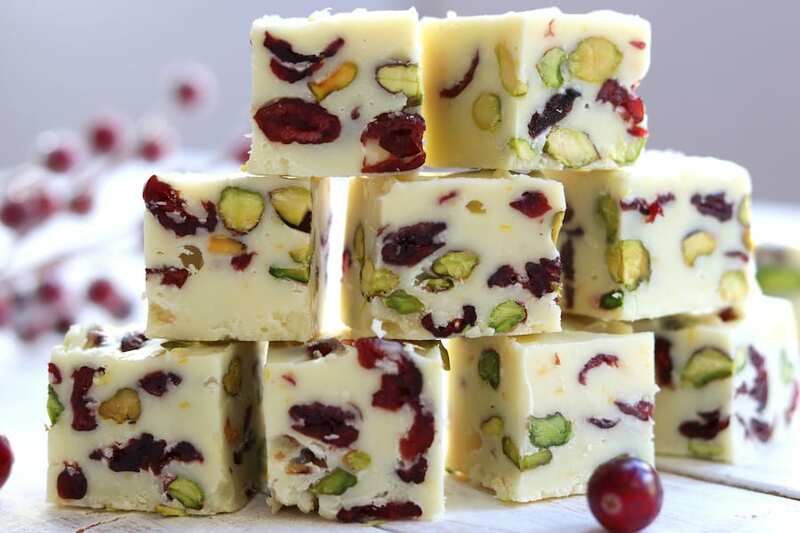 Incredibly beautiful and delicious for your Holiday festivities. In a food processor pulse separately cookies and then graham crackers until fine crumbs. Remove. Add pecans to food processor. Pulse until minced and almost crumb like consistency. Measure and add all 3 to mixing bowl. Add melted butter to crumbs and pecan bits. Stir to combine. Press into greased 9 "or 10" springform pan. Bake crust at 350℉ until golden brown on edges- about 12-14 mins. Set aside to cool. Lower oven temp to 300℉. In a stand mixer, thoroughly mix cream cheese with sugar. 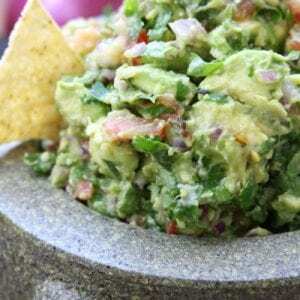 The mixture should be completely smooth before adding any other ingredients. Make sure to routinely stop mixer and scrape down the sides to ensure there are no lumps in the batter. Add eggs one at a time, scraping down the sides of the mixing bowl between additions. Add vanilla and heavy cream. Mix thoroughly. Remove half of the batter from the mixing bowl and set aside. To the remaining batter in the mixing bowl, add pumpkin, cinnamon and nutmeg. Mix thoroughly. Pour half of the pumpkin batter onto the crust. Pour the plain cheesecake batter on top. In whatever pattern you would like, add the remaining pumpkin batter. Use a knife to create a more marbled look. Place spring form into a 1/2" 3/4" water bath and bake at 300℉ for one hour. The top of the cheesecake should no longer be shiny and the center will be slightly jiggly when nudged. Thank you so much Shelley. I wish I could take all the credit but this was my cousin’s awesome creation. For this recipe does the butter need to be melted when making the crust or just room temperature? Good morning Lorraine. I apologize that I did not see your question last night. Yes, it is melted butter. I appreciate you calling attention to this and will update the recipe. Thank you! Can you freeze it after it’s baked? That is such a great question. Yes we have frozen individual pieces in storage containers for about 2 weeks. Unfortunately I haven’t frozen the whole the cheesecake so I don’t know how the appearance will hold up although I am sure it will still taste wonderful. My goodness this is a beautiful dessert and looks like a fantastic Thanksgiving dessert I would love to try. 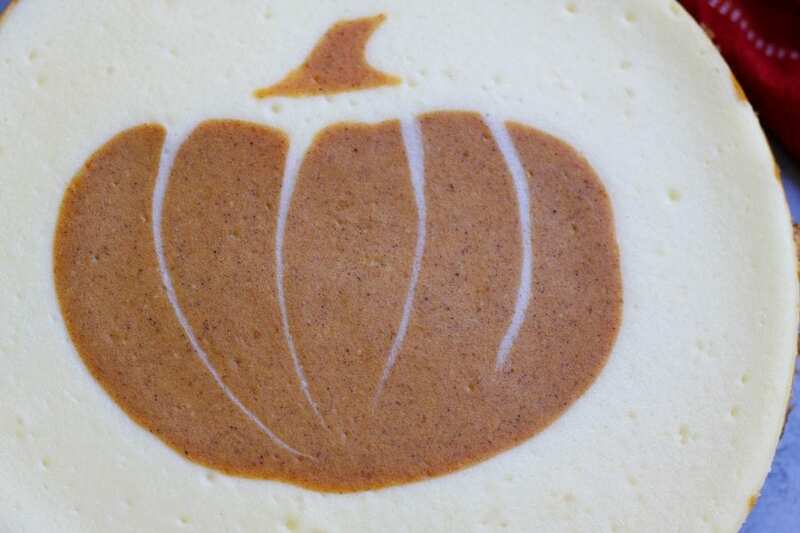 But my big question is, how did you create the pumpkin design on top of the cheese cake? Thank you! Thank you Kylie! This is my cousin’s creation and I was blown away by it not only how beautiful it is but tasty too. The video at the top of the page shows the main highlights of the creating of the pumpkin. You will probably get a better explanation from it than I could ever do. I hope you enjoy!